I WANT MY FRIGGIN’ ELECTRICITY! 99%(!) of Entergy Texas’ customers are apparently without power right now. I wish they’d actually put some effort into preparing the lines for severe weather and streamlining the repairs, instead of letting the whole thing fall apart and then getting the state legislature to approve yet another “Hurricane Cost Recovery Charge” to be added to everyone’s bills to pay to return everything to the same “ready to fail at the next batch of severe weather” state…How do I get in on this deal? Continue reading I WANT MY FRIGGIN’ ELECTRICITY! Posted on 2008-09-13 Categories Me, me, me, Pretty Pictures, The Big Room, Where Was I?Tags Electricity, Hurricane, Hurricane Ike, Ike, Lake Conroe, Power Outage, Storm, TexasLeave a comment on I WANT MY FRIGGIN’ ELECTRICITY! It’s (Still) Comin’ Right For Us! There’s some indication that Ike may be starting to curve more quickly towards the East, which would be a good thing. If Ike passes to our East, we should be in the lowest wind/fewest tornadoes part of the storm. I’ll probably post again “tomorrow” (well, after sunrise today anyway…) if internet and power are still up when I get up. 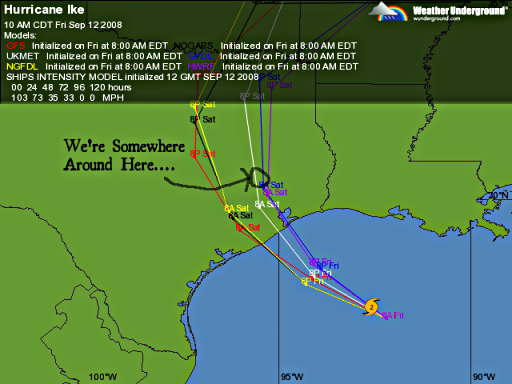 Posted on 2008-09-12 Categories Me, me, me, The Big Room, Trivial BlatherTags Hurricane, Hurricane Ike, Ike, Texas, weatherLeave a comment on It’s (Still) Comin’ Right For Us! It’s comin’ right for us! Yes, there’s a disturbingly severe hurricane “Comin’ right for us!” and I’m worrying about posting about a classic scientific paper before the blog-carnival deadline while I still have power. How’s THAT for dedication? Posted on 2008-09-12 Categories Computer Nerdity, Me, me, me, Meta-blogging, Microbiology, Science History, The Big Room, Where Was I?Tags blog carnival, blogging, Hurricane, Hurricane Ike, Ike, Science History6 Comments on It’s comin’ right for us!